It's Worlds Week! As I write this, we're in Day Two of the World Championship. If you are at all curious about Magic being played at its highest level, check out the coverage! But this is Arcana, where we share things like art and story. The story on Twitter seems to be Treasure Cruise in Modern and Courser of Kruphix in Standard, so let's look at those! Action: The Sultai revel in luxury and conspicuous consumption. In this jungle paradise, we see the great pleasure barges of the naga rulers being drawn along the waterway. They, the banks, and the surrounding walls bear paper lanterns of many colors (mainly in the Sultai impression) whose lights reflect from the waters. The boats are decorated with gold and gems, which also reflect the lanterns. Mood: Ostentatious wealth; spare no expense for our pleasure. Location: A bright, daylight, wilderness location of your choice. Action: Enchantment creatures are creations of the gods. All enchantment creatures have "starfield" in their bodies. Start with the centaur reference. 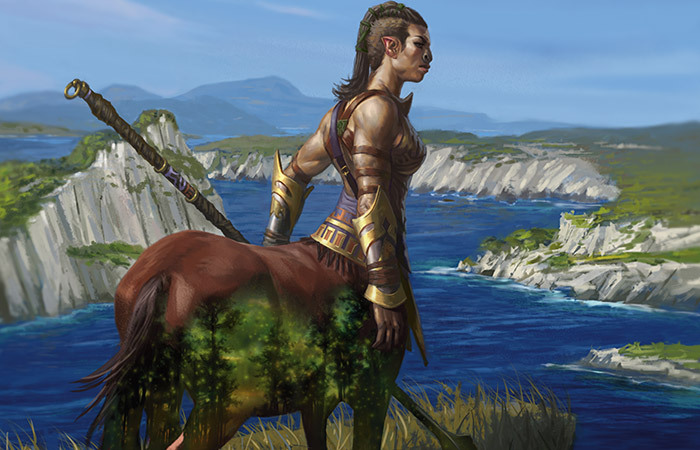 Show a female centaur exploring a wilderness location of your choice. Maybe she stands at the edge of a cliff as she surveys the horizon. Not only do her Nyx areas punch through to the different time of day, but also reveal a different location. If you place her in a forest, maybe the Nyx area shows an ocean shore—up to you. Arguably, I could have picked any two recent cards that see a lot of play to showcase here. So as a bonus, how about a third card a lot of people have been talking about recently? 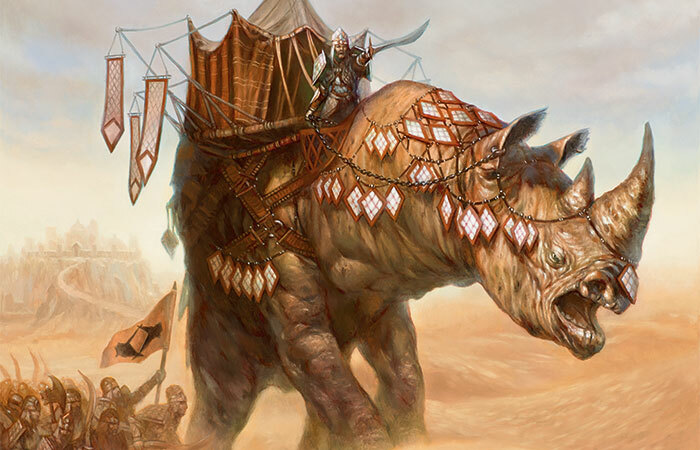 Action: Show an Abzan war rhino, a large rhinoceros-like creature like the one [in the world guide]. 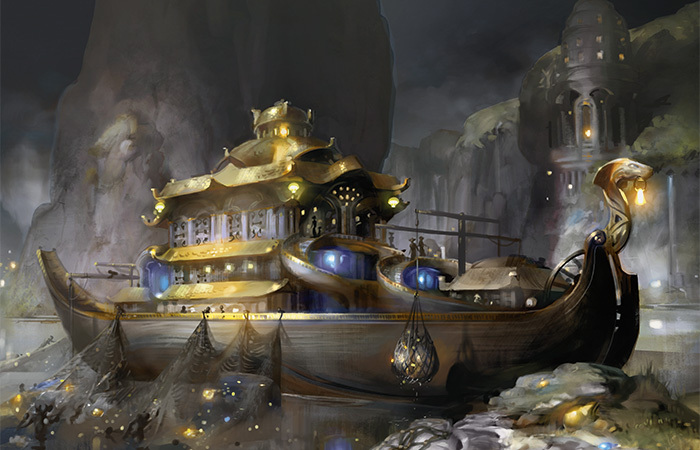 It has a small tent/shelter on its back, and has been outfitted with some piece of white dragonscale armor (like the goat-creatures are wearing [in the world guide]). A couple of Abzan soldiers ride it or walk alongside the rhino as the great beast marches to war. Mood: Nothing can stop a clan that employs magnificent beasts like this.